Unique waxy white tubular blossoms open up to 2" / 5 cm across and appear in loose clusters on the upper part of the stems. Long-lasting and very suitable as cutflowers (cut them when the spikes are half open) not in the least because of their sweet, heady fragrance. 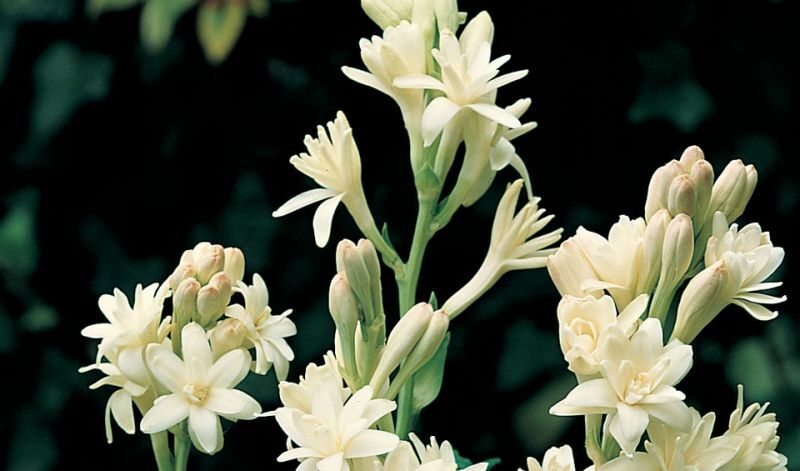 They are among the most strongly perfumed of all flowers. The Aztecs used the essential oil of the plants to flavour chocolate. Nowadays the oil is a key ingredient in many perfumes. The basal foliage is grayish-green, narrow and grassy. (Besides the species itself); 'The Pearl' (double flowering, white).